When you want to make a big change, jumping into deep water will probably not work. Instead, start with something small and simple, like journaling. A very good example from this book is the problem of obesity. Instead of going to the gym and starting a strict diet, start writing down everything you eat each day. That’s it. More habits will build naturally around this one. When you realize what you eat, and how much, you will start to slowly change your habits. 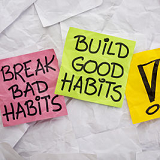 Think about the number one habit that will have the most positive impact on your life. It could be jogging every morning or better productivity. Find the keystone habit that will drive this change. Keystone habits are also known as small wins. A keystone habit is something that gives you gratification every single time. It should be small and very easy to accomplish. For example, if your final goal is to jog every morning, your keystone habit can be taking a walk just after you wake up. Define the cue for your new keystone habit and repeat it for the next 30 days. Over time, this small habit will transform into big changes in your life. Editor’s note: A good keystone habit is using HabitCoach daily. It’s easy to use, and over time it may drive huge changes.